Oh, que nena con tanta suerte! Congrats to the happy winner and thanks Caroline for this beautiful giveaway,miniregards from Spain! 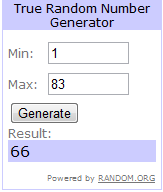 Gracías por tu sorteo y felicidades a la ganadora!!! Thank you so much Caroline for offering such a gorgeous prize!! Felicidades a Maminka y a ti gracias por haber hecho el sorteo. So glad to see you post. Left a comment last night but forgot what happened but made me wonder if it took or not. Hope it did. At least I know you are alive and well. to Loribeth on Winning your give away. y muchas felicidades a la ganadora!!! I am so excited to win!! Can't wait to see these little beauties in person. Thanks so much for your generosity. Congrats Loribeth!! You are one lucky person!!!! ¡Enhorabuena a la ganadora! Y gracias Caroline por dejarnos participar en tu sorteo. Congratulations to the very lucky winner. Thank you Caroline for this wonderful draw. Now I'm back from holiday. Thank you for the wonderful draw. Congratulations to the lucky winner.